WTUZ Radio Inc. began as a dream, born of one man’s passion for radio. Our founder Edward A. Schumacher (1952-2013) built WTUZ Radio Inc. from the ground up in the basement of his house. We went live on-air May 1, 1990 at 5:00 pm. We celebrate 28 years of broadcasting today’s hottest country music, dedicated community service, and local programming to the Tuscarawas and surrounding counties. In recognition of community service WTUZ was awarded the prestigious National Association of Broadcasters’ 2009 “Crystal Award” for outstanding community service, an award that is limited to ten stations a year. WTUZ, or Z-Country, is a full service radio station programming local news, sports, weather, FOX News Radio and today’s hottest country music. WTUZ serves Tuscarawas and 7 surrounding counties, located in eastern Ohio, about 1 1/2 hours south of Cleveland and west of Pittsburgh, two hours northeast of Columbus and 30 miles south of Canton. Tuscarawas County has a population of 92,000 and growing. Format: WTUZ 99.9FM entertains listeners with today’s hottest country, offering a unique format that combines today’s hits with classic country songs. Our Country Programming includes Crook & Chase countdown, The Original Country Gold with Rowdy Yates, The Blair Garner Show, and the popular FOX News Radio. 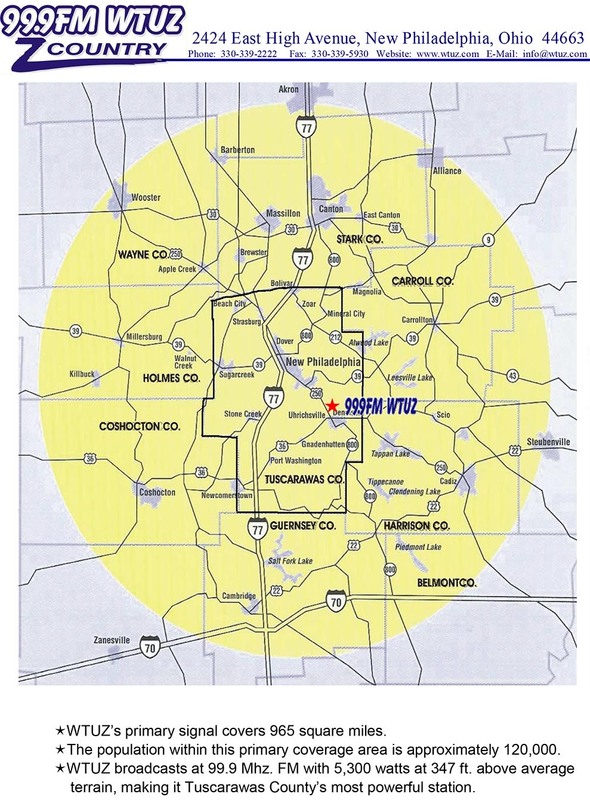 Power: WTUZ 99.9FM broadcasts with 5,300 watts of radiated power at 347 ft. above average terrain making it the most powerful station in Tuscarawas County. News: WTUZ 99.9FM provides local news Monday-Friday every thirty minutes from 6:00am- 9:00am. The afternoon newscast airs at Noon, and every hour from 3:00pm to 6:00pm. Saturday News begins at 8:00am and runs every hour until noon. WTUZ also airs FOX News Radio throughout the week at the top of the hour to keep our local community informed. Local weather is provided by Severe Weather Team 9 meteorologists and runs twice an hour every hour with the exception of special programming. Sports: WTUZ airs the Big Z sports minute once an hour in morning drive (6-9) and on Saturday mornings. The Big Z sports minute is a snap shot of professional and collegiate sports from the state of Ohio. In the fall, and winter WTUZ airs the Big Z sports show on Friday nights. The show is a collaboration of local sport fanatics. The show runs from 5pm-11pm. The show covers local area high school football, with live break in from stringers in the field. In the winter, we play a condensed two hour sports show covering local basketball and winter sports. Promotions: WTUZ 99.9FM, Z-Country, holds a variety of contests including daily birthday contests, monthly anniversary contests and on-air and/or social media contests. We give away several tickets for concerts, zoos, amusement parks, and professional sports teams through on-air contests or through the use of social media. There is always something happening at WTUZ 99.9FM Z-Country. Z-Country also uses social media to reach our listeners with up to date news, weather and community happenings through Facebook, Twitter, and Instagram. We also offer half off dinning and auctions through our website, wtuz.com.